Hi all! In this post I am going to share my experience creating a work item handler for BPM Suite 6.0.3 (which is very similar to jbpm as explained in a previous post). Let's create a really simple WorkItemHandler just to print "Hello World" in the console. 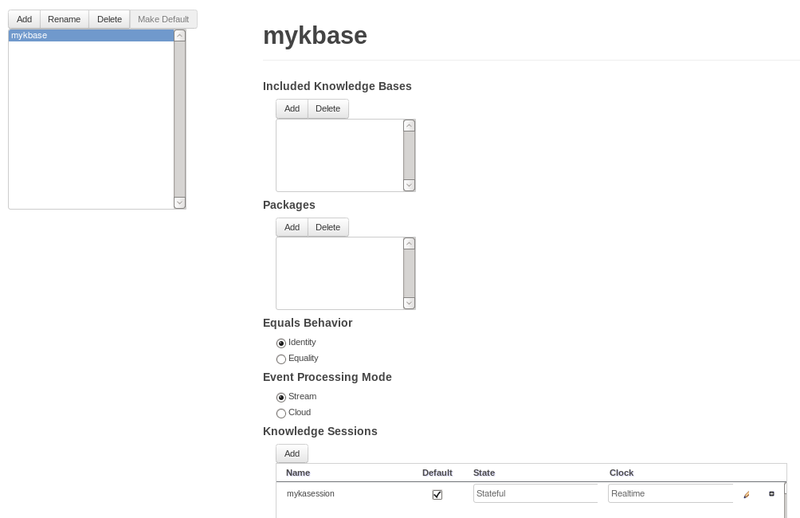 Of course you can implement more feature and make it receive parameters, access database, web services, etc. But in this post we will keep it simple. Really simple. Notice that we are importing jbpm dependency so we can find the java interface that is used to create work item handlers. Now we can build our project and go to BPM Suite to configure it so we can use this workitem. UPDATE2: Starting on jBPM 6.5, a new feature makes even easier to add new service tasks. It is described in the documentation, however we will talk about this on this blog. The first thing to do is to make our artifact visible to BPM Suite. 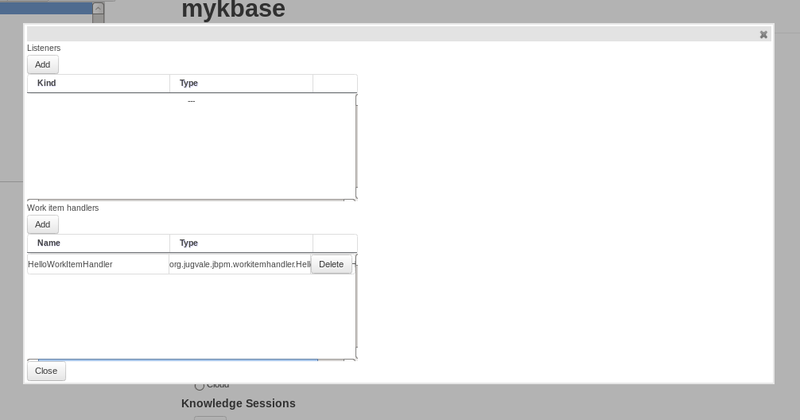 We can either import it in the maven used by BPM Suite or we can upload the JAR using the web application. In any case, the common step is to build our project. After building it, decide if you want to install it in your maven repository so you can use it in the BPM Suite project as a dependency or you can upload the JAR to BPM Suite and make it a dependency of the BPM Suite project. That's what we are going to do. 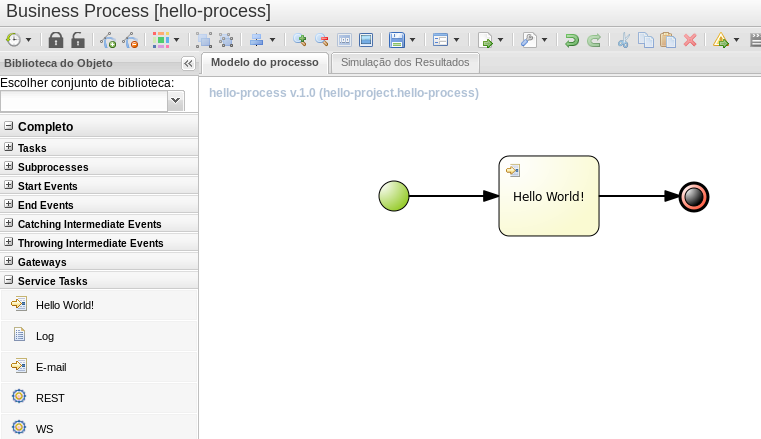 Now we create a simple project in BPM Suite. You can do this by going to Authoring -> Project Authoring and then New Item -> Project. Notice that I am considering that you have already a repository created. Now that you have your project created, let's add the artifact we uploaded as a dependency of it. To do this, select the project and go to Tools -> Project Editor and on the Project Settings drop down menu, select Dependencies. Now you can specify the uploaded artifact as a dependency of your project using the Add from repository button and choose our artifact from the list that will show up and then we are done with this part. Don't forget the save the changes. 00:25:16,904 INFO [stdout] (http-localhost.localdomain/127.0.0.1:8080-3) Hello World! have you manage to add the dependency? hello... i tried your example but when i add the jar as dependency I get the error "Parameter named 'value' cannot be null!!".. can you help me please? unfortunately not from the installation in my pc... from the pc of my collegue it works fine.so it's ok...Thanx for your reply! Hi alex. search "creating service task" and "using process data in service task" in youtube! you will find it. Jeeeesus! First normal, doable tutorial on this subject on the web. Did it! Worked! I cannot describe how I am happy. You RedHat guys! What we are able to do further with this approach is very cool. But, don't you think it's very complicated and error prone? Couldn't you make it even more complicated? I heard a lot from people searching for a proper BPM tool. After playing with jBPM for a couple of days, they escape to other tools due to its complexities. It's cool to have many features, but not too many. Please work on simplicity. jBPM developers are improving this everyday. Thanks for the article, I tried creating Custom WorkItemHandler following it but I get below error while trying to save business-process with Custom WorkItemHandler. I am facing problem, that the new task is in editor available only, when the process in "default" package. In other packages is not available. Can you help me? i followed the same steps but im not able to see "service tasks" pane at all. what could be possiblely be wrong? im using 6.4 version of jbpm. Could you please post your code on github and share for our review? I am interesting in finding what could be wrong! Hi Willam, There was syntax error. once rectified it, the problem was gone. could you please publish example to commands as well? im not able to proceed with that one.